The fourth Dwa Bratanki conference took place in Budapest on the 25th September 2018. 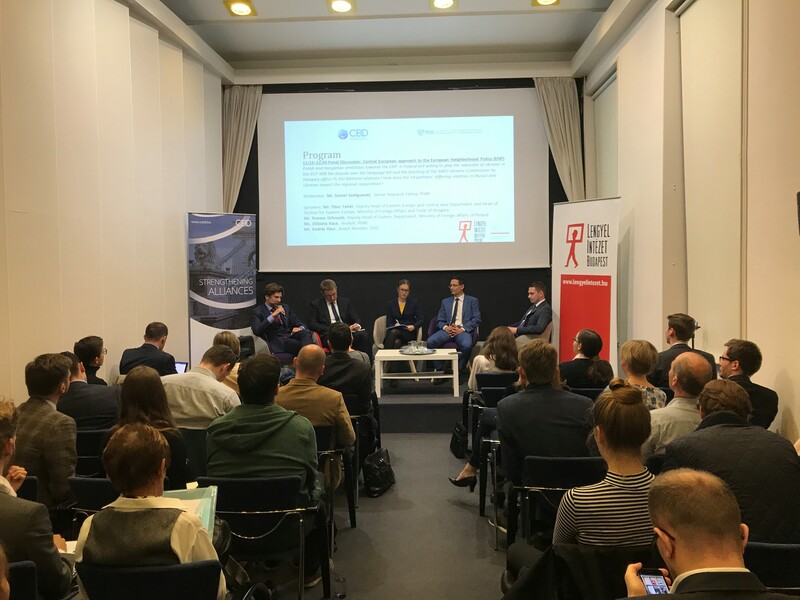 The event, organised by the Centre for Euro-Atlantic Integration and Democracy (CEID) and the Polish Institute for International Affairs (PISM) covered foreign and security policy from the viewpoint of Hungary and Poland. The conference was opened by H.E.Jerzy Snopek, Ambassador of the Republic of Poland in Hungary and Mr. Péter Pál Schmitt, Deputy State Secretary for EU Affairs at the Prime Minister’s Office. European Parliament elections: will the status quo collapse? The focus of the first panel was on the expected outcomes of the 2019 European Parliament elections and the future cooperation of Poland and Hungary on a European scale. Melchior Szczepanik, Analyst of PISM reminded the audience of the higher expected turnout in the 2019 EP elections due to the rising temperature of the Polish internal politics. He thinks that the emerging conflict between the Polish opposition and the government guarantees that the participation in the election will be much higher than five years before. Mr. Stepanik also reminded: even though Viktor Orbán clearly doesn’t fit into the European Peoples Party (EPP), pragmatically he should remain in the party family while trying to change it from the inside. Regarding the outcome of the 2019 EP elections, Tamás Boros, Research Director of Policy Solutions predicted, that the changes in the seats of the major political party groups will not exceed plus or minus 5 percent. “Of course, European politics is shifting, but the status quo will not collapse” – Mr. Boros stated, adding that the EPP, together with the Social Democrats and the Liberals will most likely be able to reach a majority. Regarding the Polish-Hungarian relations Mr. Boros believes, that in migration issues the two countries will even be able to form a blocking minority. After Mr. Boros’s analysis on the Hungarian situation, Ms. Renata Mieńkowska from the University of Warsaw tried to summarise the importance of EP elections from a Polish perspective. She believes, that the 2019 EP elections in Poland are a part of a greater election cycle, which will start with the local elections this year. The public debate in Poland regarding the EP elections are mainly shaped by sovereignty questions related to the deepening integration of the EU. However, Ms. Mieńkowska added that the Polish government is lacking a long-term vision on Europe. Poland as a regional power is only attractive to other countries of the region, if it is not isolated from Europe. Last, but not least, Mr. Botond Feledy, Senior Research Fellow of CEID has also addressed the topic. He believed, that the structure of the 2019 European Parliament will be somewhat similar to the EP in 2004, where the EPP could attach the “moderate radicals” to its side. However, the preferences of Poland and Hungary are slightly different in the EP-campaign: while Mr. Orbán will most likely “stand alone, and fight”, Poland – because of its strong Atlanticist attitude – cannot afford to be very euro-sceptical. Russia and Eastern partnership: where does the threat coming from? The second panel of the conference was reaching out beyond the borders of European Union border and addressed the Russian threat, and the state of affairs in Ukraine. According to the Hungarian viewpoint, the biggest threat is not coming from Russia, but rather from the South in the form of mass immigration – Tibor Fehér, Deputy Head of the Eastern Europe and Central Asia Department and Head of Section for Eastern Europe from Ministry of Foreign Affairs and Trade of Hungary emphasised at the beginning of his speech. He also added: while Russia is indeed a huge challenge within the region, contrary to the Polish opinion, it does not mean an existential threat for Hungary. When it came to the partnership with Ukraine, Mr. Fehér stated, that in order to make progress with our Eastern neighbour, Kiev should firstly respect the Hungarian minorities rights living in Zakarpattia. The Polish opinion was slightly different in terms of relations with Russia: Tomasz Orłowski, Deputy Head of Eastern Department from the Ministry of Foreign Affairs of Poland believed, that the Kremlin should be perceived as a real threat. However, despite the tense relations with Ukraine in terms of minority rights, Poland remains supportive to Ukraine’s Euro-Atlantic integration, Mr. Orłowski added. Elżbieta Kaca, analyst of PISM has also regarded Russia as a serious threat. According to her opinion, the Kremlin will always act against EU policies, no matter how warm the bilateral relations are. Diplomatic ties of Russia are based on the use of force, and not on voluntary participation, Ms. Kaca believed. András Rácz, Board Member of CEID emphasised, that instead perceiving Russia as a threat, we should first understand its motivations and interests. Mr. Rácz laid down, that from a Russian viewpoint, the colour revolutions in the region are nothing but American projects, and the EU’s Eastern Policy is coming hand in hand with further NATO expansion. Thus, the Kremlin’s interest is to secure its sphere of interest. Even the various integration projects became exclusive: it is no longer possible for countries in the region to manoeuvre between Russia and the West, as now they are obliged to commit themselves to an alliance: either to the Euroasian Economic Union or the Eastern Partnership with the DCFTA. Before beginning with the third and last panel discussion of the conference, Mr. Zsolt Németh, the Chairman of the Foreign Affairs Committee of the Hungarian Parliament delivered a keynote speech for the audience. Mr. Németh highlighted, that Central Europe should pin itself to the map once again, and the Visegrad Four initiative is a perfect instrument to do so. “It is more than a temporary cooperation on migration policy, it is the fundamental interest of the countries to take part in this initiative” – Mr. Németh underlined. The last panel discussed the importance of regional cooperations in Polish and Hungarian foreign policy. Mr. Márton Ugrósdy, Director of the Institute for Foreign Affairs and Trade dismissed the popular belief, that the V4 cooperation would be losing ground: in fact, regional cooperations are complimentary, thus they do not work against, but besides each other. However, despite the importance of the Visegrad Cooperation, the so-called Three Seas Initiative (TSI) is rapidly gaining ground. Mr. Ugrósdy emphasised, that even though Poland is already very active in TSI, the Hungarian government is not united on the issue, while the main goal of Hungarian foreign policy is to strengthen the Visegrad cooperation. The main problem with the V4 is that we often have too high expectations with it – Paweł Musiałek, the representative of Klub Jagielloński laid down afterwards. He considered the V4 to be dominated by Germany through its investments in the region – thus, V4 should cut itself adrift from Germany. However, TSI seems a viable cooperation in Central Europe, which is not about geopolitical influence, but business, infrastructure and economy. Łukasz Ogrodnik, the analyst of PISM however declared, that V4 is still the most important tool for the Polish foreign policy. He did not think, that the Visegrad Cooperation has gained importance with the migration crisis, it rather just gained publicity. Last, but not least, Dániel Bartha, the Executive Director of CEID was summarising the state of the regional cooperations in our region: he thought that V4 is not always an instrumental tool in a European level to form a blocking minority – it should be transferred into the policy areas, where the cooperation really matters; like energy policy or infrastructure. Mr. Bartha also added: the Visegrad cooperation for Hungary, is by far the most serious alliance, while Poland is actively taking part in several other regional initiatives. The political influence of Hungary within the V4 could further strengthen with Slovakia and the Czech Republic having relatively long government crises – Mr. Bartha emphasised.